Nepal Bhutan Tour allows you to see and experience the best of Bhutan. 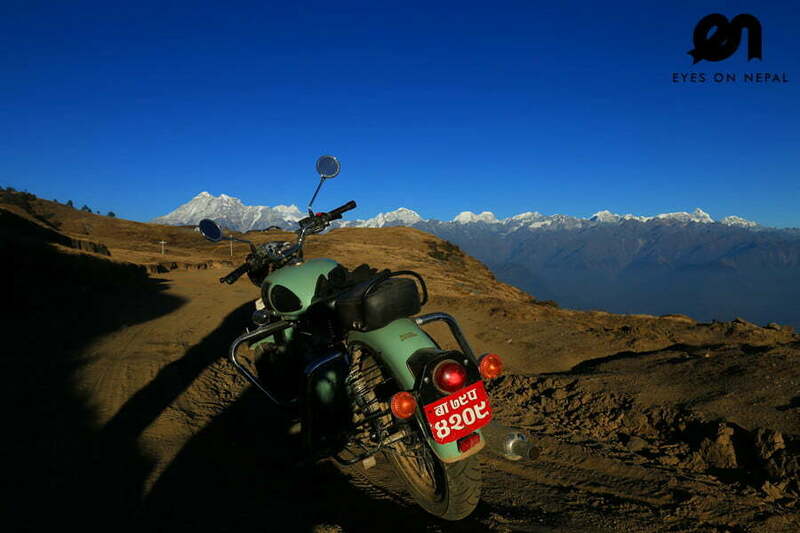 Nepal serves as a transit point for you to travel to Bhutan. 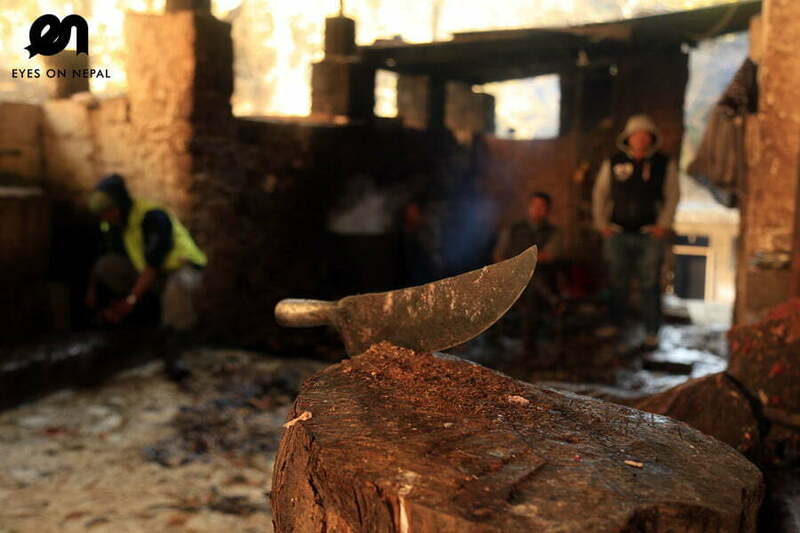 You will spend a total 6 nights in Bhutan, a the first night you will spend in Nepal. After welcomed by a good dinner with Nepalese dance performances on day 1, and staying overnight in Kathmandu, you will take a scenic flight to the city of Paro. Private tour in Bhutan will be organised for you to explore the major attractions of Paro, Thimpu and surrounding areas. You will be offered good accommodation facilities along with skilled tour guide. On the last day, you can choose to either continue your holiday in Nepal or you can fly back to your own country directly. Day 1: Arrival in Nepal : Kathmandu Airport – Your hotel in Thamel! Day 2: Nepal to Bhutan to Thimphu - International Flight from Nepal to Bhutan using Drukair! Day 3: Thimphu Sightseeing Tour! Day 8: Bhutan to Nepal - International Flight from Nepal to Bhutan using Drukair! 00.00pm: Check in. Rest & Relax. Free & easy after check in. 00.00am: Check out hotel. Pick up from your hotel in Kathmandu, and transfer to airport to catch your flight to Bhutan. NOTE: We will use: Druk Airways – Flight from Nepal to Bhutan. The Druk Airways flight to Bhutan is one of the most spectacular in the world. You will experience breath-taking views of Mt. Everest, Kanchenjunga, Jomolhari and other Himalayan peaks. Whether flying along the Himalayan range from Kathmandu or over the foothills from the southeast, each flight is a mesmerizing aeronautical feat and offers an exciting descent into the Kingdom. 00.00am: Catch your flight to Bhutan. 00.00am: Arrive in Bhutan Airport. 00.00pm: Check into your hotel and after lunch and refreshment, we will visit Big Buddha in the evening. Kuenselphodrang (commonly known as Big Buddha Point) where the largest Buddha statue in the country is perched on the hillock overlooking the Thimphu Valley and you can also enjoy 20-30 minutes nature hike through Kuensel Phodrang Nature park and enjoy the magnificent few of Thimphu Valley and mountain peaks. 06.30pm Back at hotel. Dinner at hotel. Tour ends. 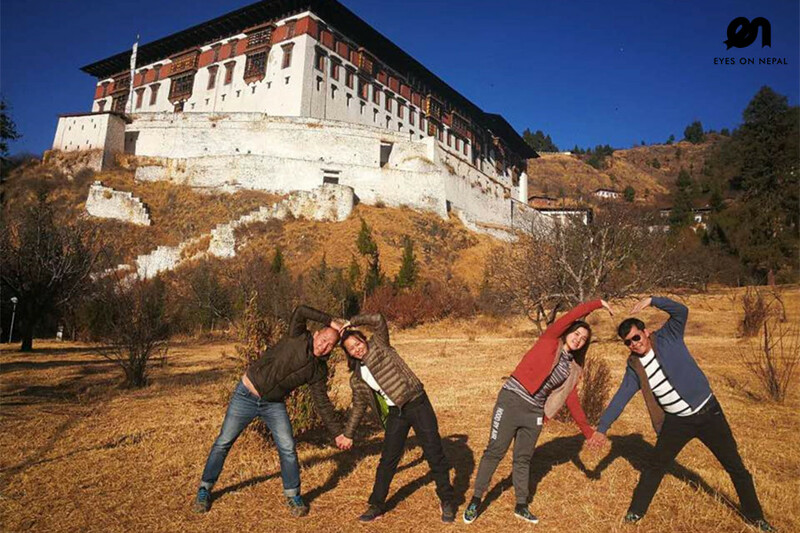 Tashichho Dzong– a fortress of the glorious religion. It was built in 1641 by Zhabdrung Ngawang Namgyel and was reconstructed into present structure by the late King, His majesty Jigme Dorji Wangchuck in the year 1962-1969.It houses the secretariat building, the throne room and the office of the king, and the central monk body. Memorial Stupa – This large Tibetan-style chorten is one of the most visible religious structures in Thimphu, and for many Bhutanese it is the focus of their daily worship. It was built in 1974 as a memorial to the third king, Jigme Dorji Wangchuck (1928–72). Early morning is especially tranquil as elderly people shuffle in, and spruced-up kids on their way to school whiz in and out to pay homage. NOTE: Thimphu sightseeing points will depend on your interests and please seek your tour guide advises. We can’t visit all. 06.00pm: Back to hotel. Dinner at hotel. Tour ends. Meri Puensum Resort or similar class hotel. 07.30am: Check out from the hotel and drive to Punakha. 11.00am: Arrive in Punakha via Dochula Pass (3100 m). Check in hotel. Description: The Dochula Pass is a mountain pass in the snow covered Himalayas within Bhutan on the road from Thimpu to Punakha where 108 memorial chortens or stupas known as “Druk Wangyal Chortens” have been built by Ashi Dorji Wangmo Wangchuk, the eldest Queen Mother. Apart from the chortens there is a monastery called the Druk Wangyal Lhakhang (temple), built in honour of the fourth Druk Gyalpo (head of the state of Bhutan), Jigme Singye Wangchuck; the open grounds in its front yard is a venue for the annual Dochula Druk Wangyel Festival. The pass with 108 memorial chortens is adjacent to the country’s first Royal Botanical Park. NOTE: Lunch en route. Dinner will depend upon your sight seeing time. 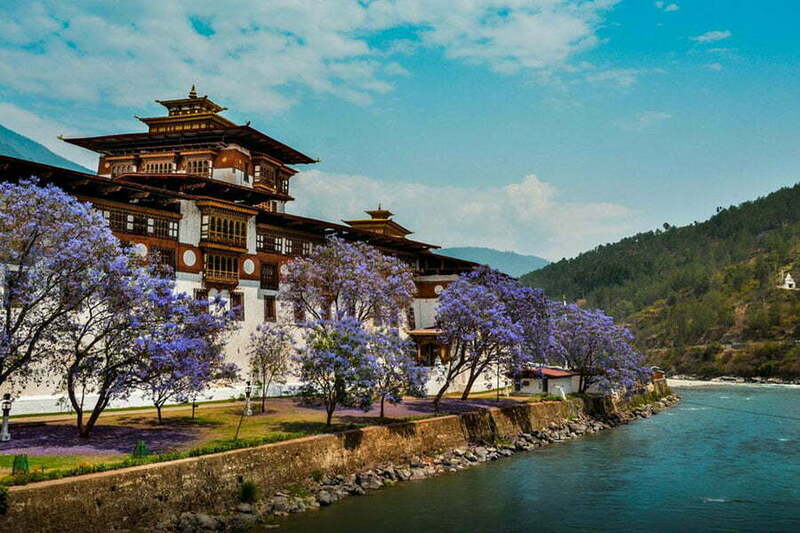 Punakha Dzong – The Punakha Dzong, also known as Pungtang Dechen Photrang Dzong (meaning very awesome dzong “the palace of great happiness or bliss”, is the administrative centre of Punakha District in Punakha, Bhutan. Constructed by Ngawang Namgyal, 1st Zhabdrung Rinpoche, in 1637–38, it is the second oldest and second largest dzong in Bhutan and one of its most majestic structures. The dzong houses the sacred relics of the southern Drukpa Lineage of the Kagyu school of Tibetan Buddhism, including the Rangjung Kasarpani and the sacred remains of Ngawang Namgyal and the terton Pema Lingpa. 07.00pm Back to hotel. Dinner at the hotel. Note: Dinner can be outside, it depends upon sightseeing time. Rest and Relax after the dinner. Beautiful nunnery built on the hill top of Walakha, join the nuns for morning prayer and later on drive further north of Punakha to visit one of the beautiful Stupa or Temple built on ridge near the Punakha river known as Khamsum Yuelley Namgyel Chorten which will take around 30 minutes to reach from the town. It was built in honour for then Crown Prince Jigme Kheser Namgyel Wangchuk which was built in 1990s and took period of nearly 10 years. From the parking, it will take another 45 minutes uphill hike to reach crossing through rice suspension bridge and rice field and return portion downhill takes around 30 minutes. After Lunch take a walk in Punakha Town and also visit some local shop to see the local product in Punakha valley. 06.00pm: Back at hotel. Dinner at hotel. Lunch en route. 08.00am: Check out hotel. We will drive to Paro. Journey will take around 4.5 hours. 01.00pm: Arrive in Paro. Check in hotel. Lunch at hotel or en route. Drukyal Dzong – Drukgyal Dzong was a fortress and Buddhist monastery, now in ruins, located in the upper part of the Paro District, Bhutan. Kyichu Lakhang – Kyichu temple – one of the 108 temples built in the 7th century by the Tibetan King Songsten Gampo. The story goes that a giant demon lay across the whole area of Tibet and the Himalayas and was preventing the spread of Buddhism. To overcome her, King Songtsen Gampo decided to build 108 temples, which would be placed on all the points of her body. Kyichu Temple is one of the 108 temples. Rinpung Dzong – built in 1645 to defend the valley against Tibetan invaders. The Dzong is now being used as an administration center and school for monks. From the Dzong you will walk down to Rimpung Bridge (Traditonal Cantilever Bridge), oldest bridge in Bhutan. 08.30am: After breakfast, hike up to Taktsang Monastery, also known as ‘Tiger’s Nest’. The climb up to the viewpoint will take around 1 ½ hours and from there you will enjoy a spectacular view of the monastery clinging to the side of the cliff. Stop for refreshment at the View Point Cafeteria.Then walk further up to the monastery which will take another 1 ½ hour. It is said that in the 8th century Guru Rinpoche flew on the back of a tigress from eastern Bhutan to this place and meditated in a cave here for 3 months. The principal Lhakhang (monastery) of the present monastic complex dates from 1692. Taktsang was damaged severely by fire in 1998 but has now been fully restored to its former glory.After visiting the monastery, walk back down to the road on the way stop for lunch at the view point cafeteria and then walk further down to the road point. 04.00pm: Then travel back to your hotel. Rest in hotel after arrive in hotel. In the evening you may relax in the traditional hot stone bath. NOTE: At own expenses. 06.00pm: Dinner in hotel with cultural show performances. After dinner, free & easy. 00.00am: Breakfast at hotel. After breakfast, transfer to airport and catch a flight to Nepal. NOTE: From Nepal, you can catch a flight to your own country or you can continue your holiday in Nepal. Accommodation in Nepal & Bhutan x 7 nights as per itinerary. NOTE: Based on twin sharing | 1 night in Nepal, 6 nights in Bhutan. All land transportation in Nepal & Bhutan. 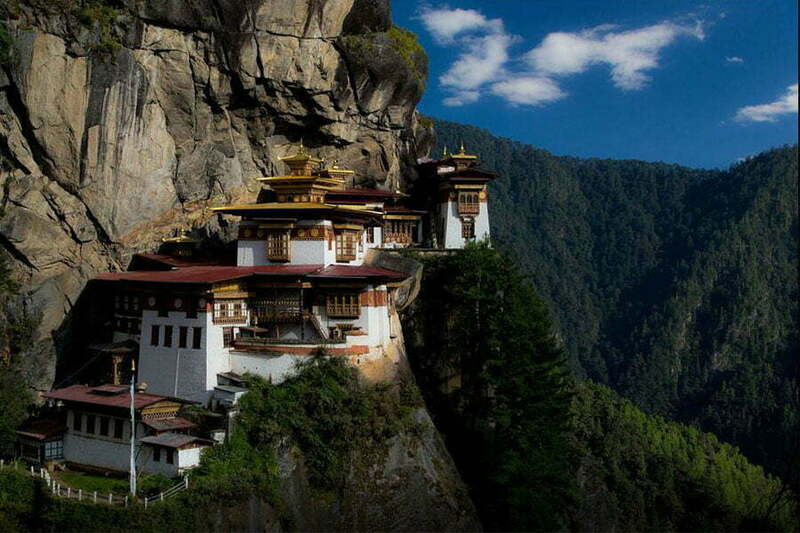 Bhutan Visa Processing Fee(USD40 per person). Bhutan daily tariff USD250 per day per person. This fee is compulsory by Bhutan Government to all tourists who are visiting Bhutan. Nepal to Bhutan international flight ticket + luggage fees USD 250. Bhutan to Nepal international flight ticket + luggage fees USD 250. 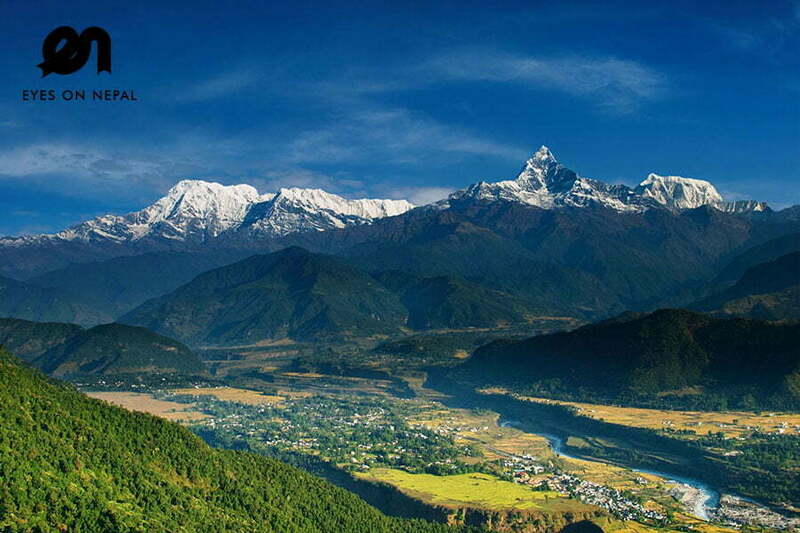 Your Country – Nepal–Your Country Return Air Fare and Airport taxes. ** 50% upon Arriving in Kathmandu Airport. Flight arrival time in Nepal and departure time from Nepal. We will reply you with an official quotation with itinerary, adjust to your flight details. 2) If you are okay with our itinerary and quotation, confirm with us in email. 4) You will be asked to take a photo of your passport, and email to us for us to process the VISA to Bhutan, and purchased flights from Nepal – Bhutan/ Bhutan – Nepal. 5) 50% deposit will be paid by your side either via Pay Pal or bank in to our Nepal Company account. 6) We will issue the official receipt to you together with your Bhutan Visa and electronic copy of Nepal Bhutan/ Bhutan Nepal flight tickets. 7) Welcome to Nepal & Bhutan. We will greet you upon your arrival in Nepal airport!